BRABUS GmbH, founded 1977 in Bottrop (Ruhr Area), Germany, is a high-performance aftermarket tuning company which specializes in Mercedes-Benz, Smart and Maybach vehicles. Brabus became the largest Mercedes tuner, other than Mercedes-AMG which became a DaimlerChrysler affiliate in the 1990s. The company began with Bodo Buschmann wanting to customize his cars, but discovered most existing customizers could not meet his thought or requirement, so he decided to start his own brand. After Buschmann had decided to start his own brand, BRABUS GmbH was originally registered in 1977 at Germany with Buschmann's friend Klaus Brackmann because German law required a company must be established with at least two people. The company name was derived from the first three characters of the founders' surnames (Brackmann, Buschmann). Following the company's foundation, Brackmann did not show interests in modifying vehicles or running a business, so he sold his company shares to Buschmann for 100 euros. In 2012, BRABUS GmbH had started building its third factory in Bottrop. Brabus's primary focus is to achieve maximum engine performance through the increase of horsepower and movement. Customers can either buy cars from Brabus, or send in their car to be customized and/or overhauled. Customers ordering a car directly involves Brabus purchasing a particular model from Mercedes and then modifying it according to the customer's requests. Brabus is known for providing expensive tuning and custom solutions. Brabus also offers cosmetic modifications including low profile spoilers, bodykits, carbon fiber splitters, and multi-piece alloy wheels. Other upgrades include racing LSDs, open racing exhaust systems, twelve-piston disc brakes, and engine remapping. Customers can also have complete engine overhauls, or have new crate engines from AMG modified for them. Brabus engines range from small 200 horsepower (150 kW) K4 blocks for SLK roadsters and CLK-Class to the 900 horsepower (670 kW) twin-turbo blocks for the S-Class. The company also provides improvements to the interior from custom upholstery, gauges, shiftknobs, pedals, and trim to various electronics such as wider LCD screens for the Maybach. smart-BRABUS GmbH: It is a 50-50 joint venture of Daimler AG and BRABUS GmbH, founded in 2001. BRABUS Classic: It is a dealer and restorer of older Mercedes-Benz automobiles. BRABUS Service GmbH: It is an authorized Mercedes-Benz service partner of Daimler AG. BRABUS Yachting: It is a boats and ships customizer. BRABUS automotive GmbH: It is a concept vehicle developer. Production facility was in a new plant erected in 2014. CRD Car Research & Development GmbH & Co. Kommanditgesellschaft: A developer and producer of special model series and accessories concepts for automobile manufacturers from around the world. It also develops and executes professional marketing strategies to market these components and cars. STARTECH: A customizer of Jaguar, Land Rover and Range Rover automobiles. BRABUS Private Aviation GmbH: An aircraft customizer. BRABUS Japan Inc. (BRABUS JAPAN株式会社): BRABUS GmbH's Asia-Pacific partner, and Japanese importer of BRABUS vehicles. EXE Corporation (株式会社 エクゼ)/BRABUS EXE: Japanese importer of BRABUS vehicle parts. BRABUS International Holdings (HK) Co. Ltd. (巴博斯中国): China importer of BRABUS vehicles. BRABUS USA: Canada and United States importer of BRABUS vehicles. BRABUS Middle East LLC: Based in Dubai, it is a Middle East dealer of BRABUS vehicles. The company has built special editions of Mercedes-Benz, Maybach, and Smart vehicles. Brabus E V12T- The Mercedes E-Class Wagon based V12T utilized a 7.3L V12 from the SL73 AMG roadster, the Brabus Sport Wagon had 582 horsepower and 571 lb⋅ft (774 N⋅m) of torque and would seat seven. 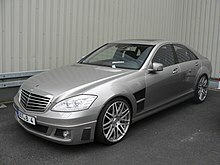 Brabus used Mercedes 5-speed automatic to handle the torque, and with rear-wheel drive it reached sixty in 4.6 seconds. Brabus ML 7.3 (w163) V12- 1998 Guiness world record. The Brabus K8 performance kit for the SL model (SL55) includes modifications to the supercharger incorporating a custom vibration damper and pulley, high-performance metal catalysts, and an auxiliary circulation pump with opposing radiator. Power is increased from a standard 476 hp (355 kW) to 550 hp (410 kW) at 6,200 rpm. The maximum torque is 780 N⋅m (580 lb⋅ft) at 3,000 rpm. The roadster is claimed reach 60 mph (97 km/h) in 4.1 seconds, passes 120 mph (190 km/h) after 13.6 seconds and reaches an electronically limited top speed of 186 mph (299 km/h). Smart forfour Brabus Hugo Boss special edition - 5 pcs. In 2006 Brabus Rocket clocked in new record for street-legal sedan at 362.4 km/h (225.2 mph). The Rocket was based on a modified Mercedes-Benz CLS-Class (W219) model. In October 2006 Brabus made another record (for a sedan) with this car at 365.7 km/h (227.2 mph). The price of the car is 348,000 euros. A world-record speed of 330.6 km/h (205.2 mph) set on the high-speed test track in Nardo, Italy; Brabus added to its extensive collection of automotive records with a Maybach 57 powered by a 730-hp (720 hp SAE net) / 537-kW Brabus SV12 S Biturbo engine(s). In the beginning of 2012,the world’s fastest street-legal sedan was a Brabus Rocket 800. The 2012 Brabus Rocket 800 is powered by a V12 engine which provides 800 hp and 1,420Nm of torque, which has been limited to 1,100Nm. The Brabus Rocket accelerates from 0 to 100 km/h (62 mph)in 3.7 seconds, 23.8 seconds to 300 km/h (186 mph) and has a top speed of 370 km/h (230 mph). ^ "Geneva Motor Show Preview: The BRABUS G V12 S Biturbo Mercedes-Benz G-Class | eMercedesBenz - The Unofficial Mercedes-Benz Weblog". eMercedesBenz. 2009-02-19. Archived from the original on 2009-04-14. Retrieved 2009-04-29. ^ "2011 Brabus Mercedes-Benz G-Class 800 Widestar". Seriouswheels.com. Retrieved 2011-09-27. ^ "Brabus Rockets to 366km/h World Record". Worldcarfans.com. 2006-11-20. Retrieved 2011-01-09. Wikimedia Commons has media related to Brabus vehicles.